Peter Francis offers another fun and sweet adventure to Henry Bears travel. This time he is off on an adventure to Texas. Living in Texas, I just have to say, you can't go wrong on a visit to this great state. Henry Bear travels to all the regions of Texas and shows off the highlights. 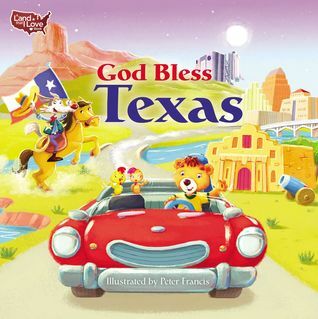 This is definitely a book for families who love Texas. The rhyming helps the flow of reading as you travel with Henry. The colors and pictures are bright and eye catching and helps to spotlight these most well known areas for kids to see and understand. I can't wait to see where else Henry Bear will travel to. Thank you to Zonderkidz, I received a copy of this books for free in exchange for an honest review.